38 Chairs brings a little piece of Italy to Melbourne. Owner Gino Forlano grew up on the Amalfi Coast and has an impressive resume, starting his life in hospitality in Salerno and London before making his way to Australia 16 years ago, where he continued to develop his skills with various stints at establishments like Jacques Reymond, Sassi (Port Douglas), Caffé e Cucina and Katerina Cucina e Bar. Under Gino's guidance, Caffé e Cucina, was awarded the “Ospitalita` Italiana” by the Italian Chamber of Commerce for the best Italian restaurant in Australia. After that achievement, in 2012, Gino decided to pursue the new challenge of running his own restaurant in Melbourne. Named after the 38 chairs in the first version of the restaurant, the restaurant has grown since with locations in both South Yarra and Carlton) but continues to retain its charm, intimate setting and notably, its stunning food. We start with the Carpaccio di Tonno. 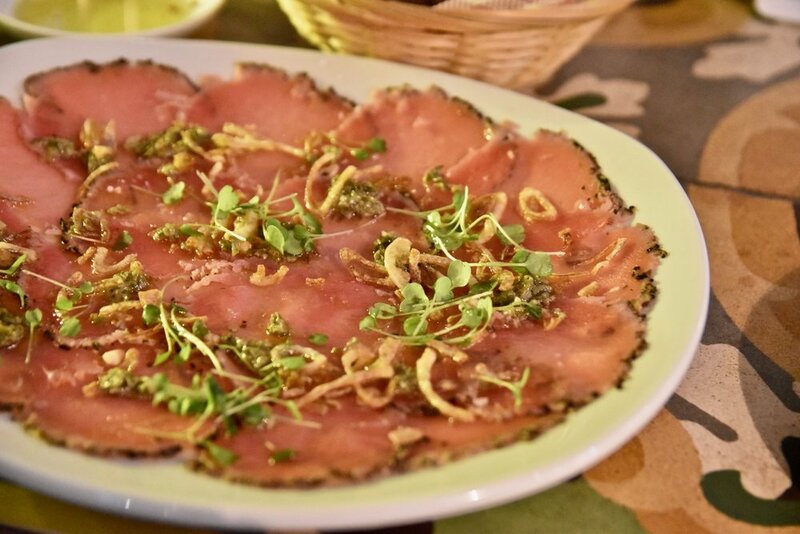 The carpaccio of tuna arrived as a plate of thinly sliced peppered yellow fin tuna topped with crispy shallots, caper vinaigrette and micro herbs. 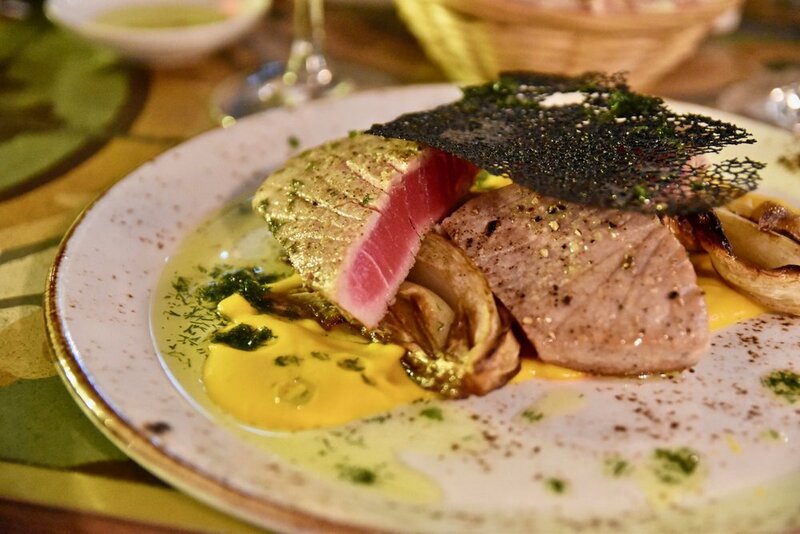 It was a triumph of a dish both in terms of texture and taste, with the tender slithers of tuna contrasting nicely with the crispy shallots and the caper vinaigrette enhancing the lovely oily texture of the tuna. A selection of salumi and cheese followed which displayed superlative flavours comprising of a respectable assembly of Salami Piccante, Prosciutto Parma, Mozzarella Di Bufala, cheeses and bread. Each of the cured meats were stunning, possessing a richness that had been further enhanced by the flavours of the intense curing salt mix. The cheeses (the Truffle Pecorino being our favourite was similarly enjoyable. As expected of any acclaimed Italian eatery, 38 Chairs is particularly good at producing quality pasta dishes. The Reginette Ricce al Ragú di Anatra (the restaurant's signature dish) was no exception. Ribbons of curly pasta were intertwined amongst lashings of tender duck ragu, porcini and shaved pecorino. The flavours were complex and rich. Texturally, the tenderness of the duck contrasted nicely with the perfectly cooked pasta. The Lasagna all’uovo con Funghi e Crema di Formaggi was yet another shop stopper. It was comfort food at it's best and boasted perfectly balanced flavours. Think layers of egg lasagne combined with mushroom ragú, decadent besciamella cream and truffle oil. It was like a hug from nonna. Our final main course of tuna, carrot puree and fennel met our expectations admirably. A light searing ensured that each slice of tuna was lined with a thin layer packed with caramelised flavour. The tuna was sublime with a decadent melt in the mouth, almost buttery, consistency and went beautifully with its accompaniments. 38 Chairs’s rendition of a pannacotta was texturally perfect. The camomile pannacotta was silky smooth and simply melted in our mouths and we loved how it was served with a cheeky chocolate soil and oats biscuit - a perfect contrast for the pannacotta's silky texture. We also loved the dessert special of yoghurt reduction (which had the texture of a mascarpone) served with Sicilian blood oranges and beautifully presented in a homemade chocolate cone. Just yum! 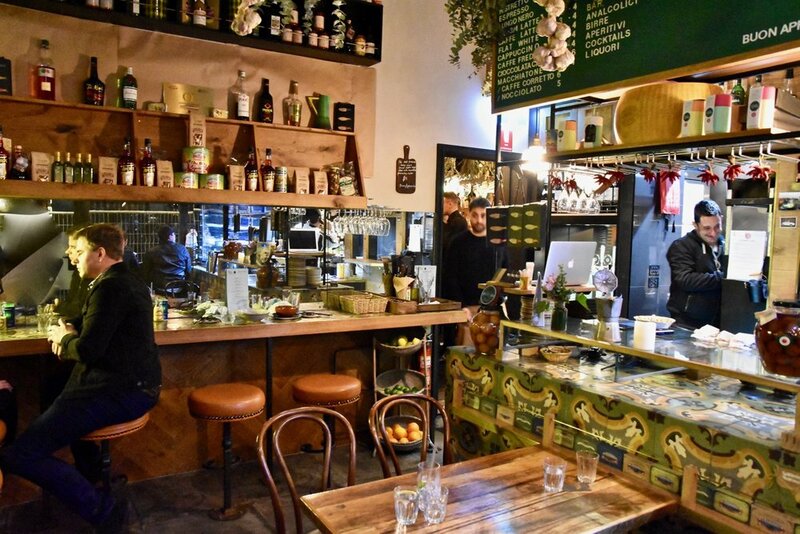 38 Chairs combines friendly and affable staff, wonderful ambience, exceptional food and one hell of a beverage list to deliver an enchanting experience - one that transports you to straight to Italy.